امروزه استفاده از مواد نوین جهت بهبود ظرفیت باربری خاک کاربرد فراوانی دارد. نوعی از مصالح جدید مورد استفاده در این زمینه ژئوسنتتیک ها است. بلوک های ژئوفوم نوعی از ژئوسنتتیک ها بوده و کارایی مناسبی داشته و جایگزین خاکریز پشت دیوار حائل یا لایه های روسازی راه می شود. هدف اصلی در تحقیق حاضر بررسی تاثیر میزان ذرات ژئوفوم بر روی بهسازی ظرفیت باربری خاکهای ماسه ای گردگوشه و تیز گوشه است. میزان ذرات ژئوفوم ٠٥/٠، ١/٠و 15/٠ درصد وزنی مصالح مورد مطالعه در نظر گرفته شده است. به منظور ارزیابی میزان تاثیر گذاری ذرات ژئوفوم برپارامترهای ژئوتکنیکی خاکهای ماسه ای مخلوط شده با ژئوفوم آزمونهای آزمایشگاهی تراکم، برش مستقیم (تحت اثر تنش های قائم 1، 2 و 3 کیلوگرم بر سانتیمتر مربع) و نفوذ پذیری انجام گرفته است. نتایج بدست آمده از تحقیق نشان دهنده آن است که در حالت کلی با افزودن 15/0 درصد وزنی ژئوفوم به مصالح مورد مطالعه سبب بهبود وزن مخصوص خشک حداکثر، کاهش نفوذپذیری و افزایش مقاومت برشی شده است. اگرچه تاثیر ذرات ژئوفوم در خاک ماسه ای تیز گوشه به مراتب بیشتر از خاک ماسه ای گرد گوشه می باشد. 2- Koerner R. M., 2005, Designing with geosynthetics, Pearson Education, Inc., 5th edition. 4-Horvath, J. S., 1995, Geofoam Geosynthetic, Horvath Engineering, P.C., Scarsdale, NY, pp.229. 5- Elragi, A., 2000, Selected Engineering Properties and Applications of EPS Geofoam, Ph.D. Thesis, State University of New York, Syracuse, N.Y.
6-Hazarika, H. 2006, Stress-Strain Modeling of EPS Geofoam for Large-Strain Applications, Geotextiles and Geomembranes, 24, 79-90. 7- Saradhi, B. D., Ganesh, B. K. and Tiong H. W., 2006, Effect of Polystyrene Aggregate Size on Strength and Moisture Migration Characteristics of Lightweight Concrete, Cement and Concrete Composites, 5, 520-527. 8-Negussey, D., 2007, Design Parameters for EPS Geofoam, Soils and Foundations, Japanese Geotechnical Society, 47(1), 161-170. 9-Illuri, H. K., 2007, Development of soil-EPS mixes for geotechnical applications, Ph.D Thesis, Queensland University of Technology, Australia. 10-Aytekin, M., Banu, Ikizler S. and Nas, E., 2008, Laboratory Study of Expanded Polystyrene (EPS) geofoam used with expansive soils, Geotextiles and Geomembranes, 26, 189-195. 11-Deng, A. and Xiao, Y., 2010, Measuring and Modeling Proportion-Dependent Stress-Strain Behavior of EPS-Sand Mixture, International Journal of Geomechanics, ASCE, 10, 214-222. 12-Najmaddin, D. Y. and Canakci, H., 2013, Compaction properties of sand mixed with modified waste EPS, Geotechnical and Geological Engineering, 31, 305–318. 13-Kan, A. and Demirboga, R., 2009, A new technique of processing for waste expanded polystyrene foams as aggregates, Journal of Material Processing Technology, 20, 2994-3000. 14-Heydarian, H., Nejad Shirazi, A. and Nasehi A., 2012, Study of Geofoam Weight Percent Effects on Bearing Capacity of Lighted Soil by Geofoam, Proc. 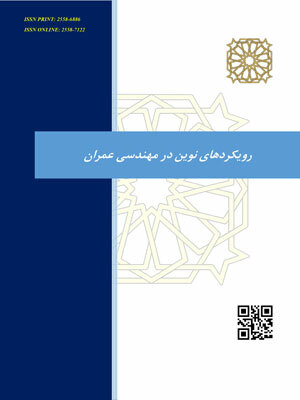 1st National Conference on Civil Engineering, Zibakenar, Iran, February, 1-6, (In Persian). 15-Nejad Shirazi, A., Heydarian, H. and Jam, M. R., 2015, Study Strength Behavior of Soil and Geofoam Mixture with Several Weight Percent and Size of Geofoam, Proc. 10th International Conference on Civil Engineering, Tabriz, Iran, 15-22, (In Persian). 16-Hasanpouri, N. N. and Dabiri R., 2018, Effects of Geofoam Panels on Static Behavior of Cantilever Retaining Wall, Advances in Civil Engineering, pp.1-18, 2018. 17-Hasanpouri, N. N. and Dabiri R., Effects of Geofoam Panels on Statically Behavior of Gravity Retaining Wall, Tarbiat Modares Journal of Civil Engineering, 2018, 18(5), 31-44. 18-ASTM D421-85, 1985, Dry Preparation of Soil Samples for Particle-Size Analysis and Determination of Soil Constants, Annual book of ASTM standards, (reapproved 1998). 19-ASTM D422-63, 1963, Standard Test Method for article-Size Analysis of Soils, Annual book of ASTM standards (reapproved 1998). 20- ASTM D 854-02, 2003, Standard test method for specific gravity of soil solids by water pycnometer, Annual book of ASTM standards. 21- ASTM-D 698-00, 2000, Standard Test Methods for Laboratory Compaction Characteristics of Soil Using Standard Effort (12,400 ft-lbf/ft3 (600 kN-m/m3)), Annual book of ASTM standards. 22-ASTM C305-14, 2014, Standard Practice for Mechanical Mixing of Hydraulic Cement Pastes and Mortars of Plastic Consistency, Annual book of ASTM standards. 23- ASTM D 3080-98, 1998, Standard test method for direct shear test of soils under consolidated drained condition, Annual book of ASTM standards. 25- ASTM D 2434-68, 2006, Standard test method for Permeability of Granular Soils (Constant Head), Annual book of ASTM standards.